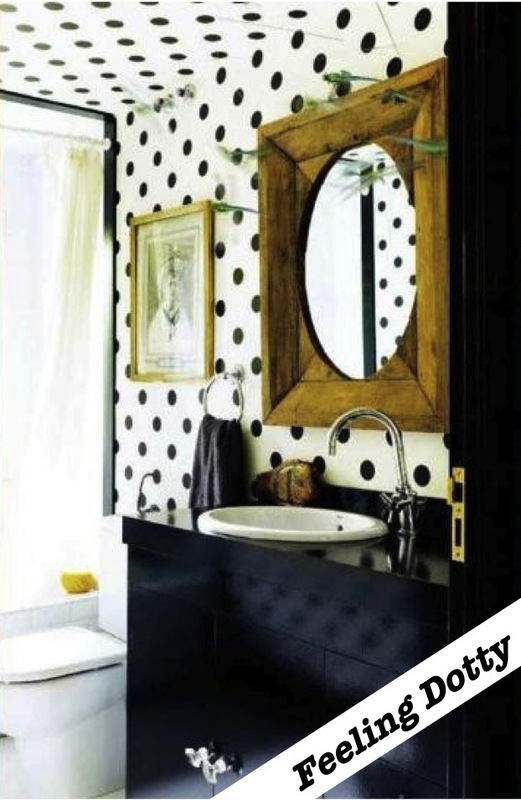 How incredibly cute is this polka dotted bathroom?! I have no idea where I found it, but every time I look at it I want to do a little happy dance. The polka dot wallpaper adds an element of whimsy to the small space and by wallpapering the ceiling it actually looks larger. The crystal knobs and gold framed mirror bring on the glam but the white and black color palette prevents it from being overly girly. Eek–so cute! I would love this! I've never seen this before...what a cute idea! That bathroom is too cute. Love the dots and rusty looks. Cute! i love this! its so hard to find a bold pattern for small spaces (e.g. bathrooms) that doesn't overwhelm, if not tighten the quarters. i adore this. its jaunty without being bubblegum. A bathroom like this would make waking up and getting ready a lot funner!